Tungsten carbide is widely used in industry because of its extraordinary properties. 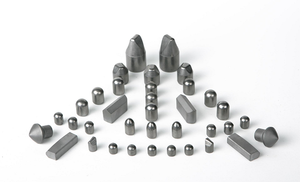 Because of its wear resistance and hardness (9.8 Moe's scale), tungsten carbide is ideally suited for wear parts, other machine parts and dies which are subject to severe service conditions, such as high temperatures, corrosion and abrasion.. In recent years, tungsten carbide has emerged as a superior alternative to steel in many industrial applications. For rotary rock drill bits for medium soft and medium hard rock;and for coal cutting picks for cutting of stone containing formations. For tipping of bits for heavy rock drills and rotary hammer rock drills cutting hard rocks. making rotary percussing drill bits and heavy duty drill bits. YG15C For making drill cone to drill all kinds of rock formation. Suggestion: We would like to recommend suitable grade depending on your requirements.